') }, });	}); What is an LCD digitiser? What is an LCD digitiser? 8. LCD Screen connector (would connect to motherboard of laptop). 9. LCD screen glass (the bit you look at when using the computer). 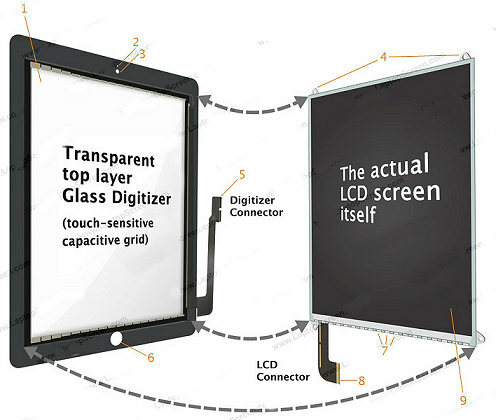 With reference to laptop and tablet screens, the digitiser is the touch screen glass that sits over the top of the LCD screen. Digitisers exist all around us in today's electronic world. From cameras to scanners to touch screen laptops and tablets, we all use digitisers on a daily basis without even realising they are there. A digitiser's job is to bridge a gap between the real world (analog) and the electronic world (digital). In the digital world, computers interpret numbers and work using mathematics. If you scanned a photograph into your computer, your computer will store that photograph as a series of numbers on your disk drive. When you wish to see the image again, you can open it and the computer will translate those numbers back into the image you scanned to view again and again. The computer uses a mathematical process to turn the image into a code that can be stored by the computer and then later deciphered back into your image. This process of coding is called digitising. The same process of digitising applies to music that is stored by a computer. Your MP3 and MP4 tracks are digitised copies of the original music. Any computer interpretation of a real life event requires the event to be converted or digitised into numbers so the computer can store or interpret the event. Touch screen laptops interpret your finger movements using a digitiser panel, which is a glass layer that is placed over the LCD screen. The glass layer sits on top of the screen and is covered with sensors. A flat ribbon cable will leave the digitiser layer and connect with a connector at the back of the LCD screen. The digitiser is sometimes removable but can often be fused to the LCD and non removable. The likelihood of one digitiser working on a different screen is slim, usually digitisers will only work on the screen they were fitted to. This is because the screens are usually slightly modified to allow the digitiser to function. If you purchase a replacement screen without a digitiser, it is unlikely you will be able to re use your existing digitiser on your new screen. Digitisers are mostly produced in China, and are usually specific to the laptop or tablet device they will be fitted to. It is unlikely a digitiser screen for an Asus laptop will work in an HP for example. WACOM and FOXCONN are the two largest manufacturers of touch panel digitisers at the time of writing. The digitiser will communicate with the LCD screen itself to determine screen resolution and aspect ratio, and then convert the pressure from sensors within the digitiser layer into movements via software on the device. This clever software will then interpret these movements as a mouse navigation, and you will be able to move the pointer and click on things on your screen, using your fingers. Apple and Google who produce IOS and Android respectively; both use a complex software system to interpret gestures on the digitiser panel, allowing simple applications to be used with no mouse. Microsoft have developed this feature within Windows 8, however this system of touch navigation has yet to prove popular with laptop devices. After fielding a study into touch screen display technology in laptops, Apple discovered that sitting in front of a laptop with arms extended was a particularly uncomfortable task; especially if you needed to extend your arm to touch all day long. Instead Apple concluded that touch technology is more suited to smart phone and tablet use.